The Creatures Evolution Engine is the name given to the game engine used by Creatures Adventures, Creatures Playground, Creatures 3, Docking Station and Amazing Virtual Sea-Monkeys. It is also referred to as c2e, which is the internal Creature Labs name for the engine (which, according to Lisa de Araujo, stands for 'creatures 2 enhanced'). 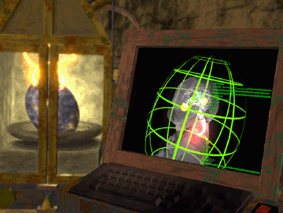 It was almost a complete rewrite, built using C++ and the STL, and written in a portable manner (it was eventually ported to Linux and Mac OS X) as opposed to the Windows-centric design of the previous engines. It defaulted to full-screen mode and provided the game's user interface using agents, rather than using external applications ('applets') like the previous games in the Creatures series. It also introduced the PRAY format, various CAOS features and, eventually, networking abilities (Babel). Several of the settings for the engine are contained within the config files. There is an open-source 'clone' of the Creatures Evolution Engine called openc2e. This page was last modified on 22 August 2014, at 02:37.